They say she was buried in her dancing shoes by her grieving parents because she loved dancing more than anything. Resurrection Mary is one of the most famous ghost stories in the world. Many people have given her a ride only to have her vanish in front of Resurrection Cemetery, which is where she is interned. 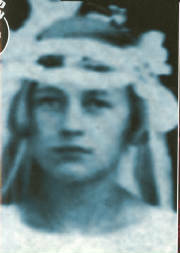 She is described as a young Polish-American girl with blonde hair and wearing a white dress. She is anywhere between the ages of 16 and 22. The legend goes that she was at the O'Henry Ballroom, which is now called the Willowbrook Ballroom, with her boyfriend. After a heated argument, she left in a huff, refusing a ride home from him. Carrying her dancing shoes and only wearing a light jacket to keep her warm on a very cold night, she walked home along Archer Avenue. From there it gets a little fuzzy as to the details of her death, but the theory used most is she was hit by a hit-and-run driver. Some people believe it was her boyfriend, but no one really knows for sure. In 1939 a young man named Jerry Palus was enjoying an evening out at the Liberty Grove Hall when he spotted a beautiful blonde-haired girl wandering alone on the dance floor. After dancing with her the entire evening, he ended up taking her home. This is when he noticed that she was coldto the touch. When he asked her where she lived, she said in Bridgeport. On the way , she decided she wanted to go down Archer Avenue past Resurrection Cemetery. As they neared the cemetery, she beganto act stranger. She told Palus that for some reason she had to run to the cemetery gates and that he could'nt follow. Before he knew what was happening, she had darted off towards the gates. About halfway there, she just disappeared. The next day he visited the address that she had given him and was greeted by an older woman who told him that her daughter Mary had died five years ago. He evenrecognized her pictureof her sitting on the table. till the day he died, he was positive he danced with Resurrection Mary. Rumor has it that there are three Mary's somewhat fitting her description buried at the cemetery. Mary Begrovy is one who people most identfy as being Mary, but there are too many contradictions with her appearance. Another was Mary Rozanc but she died in 1930. Another Mary is buried there. Anna "Mary" Norkus who was killed in a car wreck along Archer in 1934 has gotten alot of attention, too. But she was only twelve. So who was Mary? We may never know but one day she may find the rest coming to her.